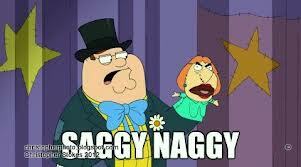 Saggy Naggy. . Wallpaper and background images in the Peter Griffin club tagged: family guy peter griffin peter funny lois. This Peter Griffin photo contains аниме, комиксы, манга, анимационные фильмы, комикс, мультфильм, and книга комиксов.